We've noticed that a lot of users (ourselves included) have a bunch of sites that they're interested in, but don't necessarily check in that often. While power-users can set up filters on stackexchange.com, the average user isn't going to figure that out. Would you sign up for this? Any ideas for more / different content? We're intentionally keeping it simple so that it doesn't feel like your typical spam newsletter, but we're open to ideas. Over at How-To Geek, we've got 135,000 daily email newsletter subscribers, and we've definitely found it to be a superior way to bring casual users back to the site on a regular basis. So an email newsletter is a MUST for casual people, who don't care about RSS. There's no substitute. I've also found that the type of users that subscribe to an email newsletter are VERY likely to interact on the site, leaving comments or answering reader questions. That said, this particular newsletter looks rather boring. Why do I, the casual user, care about some random user that I don't know, and whether they answered a question? That's irrelevant information, clutter, and visually unappealing. What I'd propose is listing out the top 5 questions for the week, along with a short excerpt. If you used some icons in there to visually break up the text, it would be even better (maybe the avatar from the question-asker). You could do the same thing with the "Can you answer these?" section - I like the idea of listing those, but I think you have to show an excerpt of the text. You could even show the vote count similar to the site display. Allowing the site mods to "feature" something interesting would also work well - putting a tip directly in the newsletter would be pretty useful for the reader. Finally, the last critique is that you need a better header image on the newsletter. No, I wouldn't sign up. The newsletters have what appears to be random questions and answers in them. Considering how easy it is to favorite tags, the newsletter would be clearly inferior to just visiting the site. To do something along this line, time could be better spent adding the ability for users to have a customized RSS/Atom feed that uses a similar algorithm to the one StackOverflow's Interesting tab uses... it would (IMHO) be better than a newsletter in every conceivable way. There are a lot of sites I'm interested but just don't have the time to hang around them. Big per-site-Meta decisions could also be mentioned. Maybe a summary of how the site is doing, a Meta summary of the week. And definitely tell us about any feature changes on the site. I still find the linking of the last couple of words only for questions to be weird/awkward. Other than that, good job. While I wouldn't use this personally, being quite accustomed to customized feeds in my RSS reader of choice, I know many people who would use it (none of whom, to my knowledge, participate on MSO) especially from our less technology-related sites like cooking, parenting, and writers. In general, I like it. A platform for publishing important news and events is great to have, and seeing some top questions might make for interesting (yet also easy to discard) reading. There is clearly a pretty broad distribution of people who visit SO/SE. Visit once, never to return. Would probably consider newsletter junk mail. Visit once a week. Yeah, a newsletter would help me feed my addiction - something to read while in office on my blackberry while I visit the loo. Go for it. Visit daily. (like me) Nope. I'm already addicted a newsletter is junk mail. So that, 'visit once a month' crowd is going to be hard to target, from a marketing perspective. If you pick from the hottest questions, you're implicitly assuming that these individuals are like everyone else on SO/SE (but they don't visit it as much / aren't addicted yet). However, they might have only come here for one or two topics -- hence, the newsletter might be a lot of noise and very little signal. If you try to pick a narrow set of topics, alternating weeks with interesting tags or something, this might be more aptly received, but it might also drive them away because of a perception that the sites really cares about only a few subject areas? On Super User we vote for a Top Question of the Week, which goes up on our blog every Monday. This is another thing that would be great to include in the newsletter. It would be really nice if there were some built-in nomination/voting system for the QotW applied to all sites (or at least with the site's moderators' approval), which could be automatically included in the newsletter. It's been a great way for us to highlight high-quality questions and answers as an example to the community and to reward those who've done a good job. I probably won't sign up for the SO newsletter permanently (although I just have done so to test), since I visit SO on an almost daily basis. I probably would sign up for other sites, becasue most other sites I only visit once in a while. In a way that would be a reminder of where I'm registered but haven't visited in a longer period of time. Also, for most of those sites, the provided list of "interesting" or even "random" questions will in some cases provide a trigger to go back and have a look again. I think it's a great idea, and I just subscribed to a few sites that I'm interested in but where I'm not a frequent visitor. However, I would really prefer if the all the newsletters were aggregated into one e-mail. If I'm marginally interested in 10 different topics, that means 10 different e-mails, which is a clutter. Just send it all together and make sure the formatting shows a clear distinction between the separate sites. Not the answer you're looking for? Browse other questions tagged discussion email feedback newsletter . 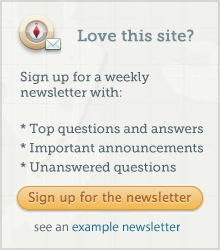 How do I subscribe for a site's weekly email newsletter? Newsletter: “can you answer these?” section - is it unique for each recipient? How can my question be chosen for the newsletter? How does the system select questions in the newsletter? 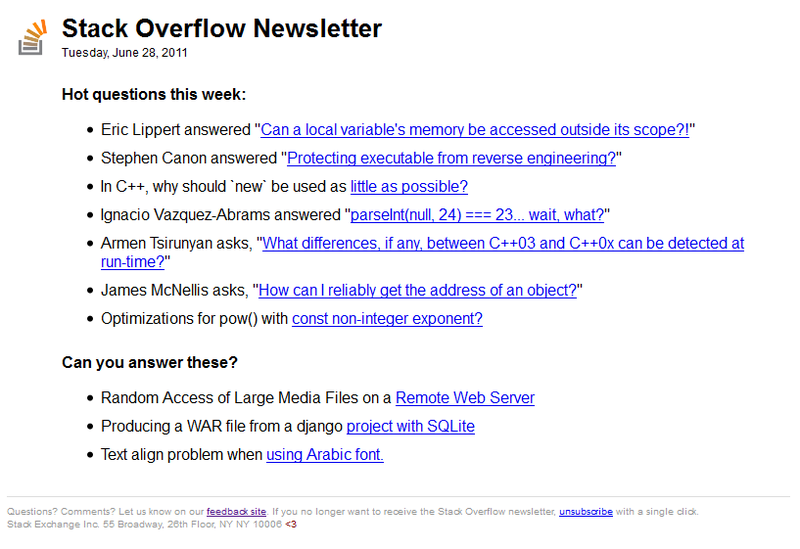 Can newsletters take into account a user's favorite tags on that site?